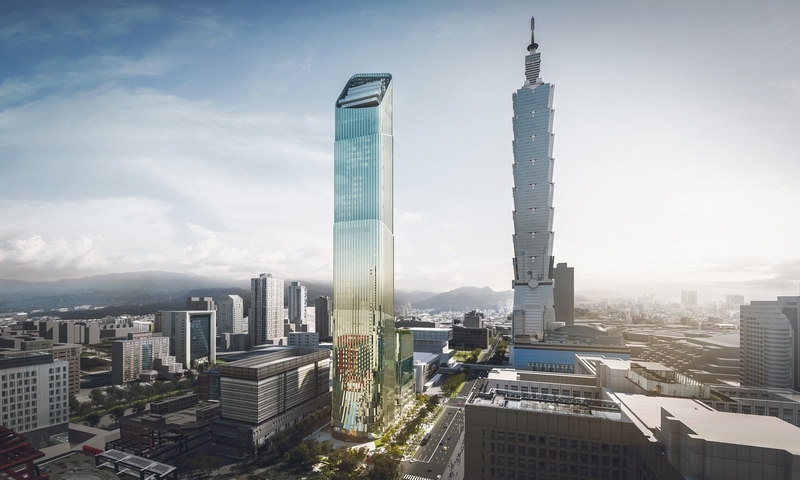 (23 January 2018, Taipei) After the long-awaited completion of review process, Riant Capital unveiled its final selection of hotel operator, architect and designers for the highly anticipated development Taipei Sky Tower (TST). 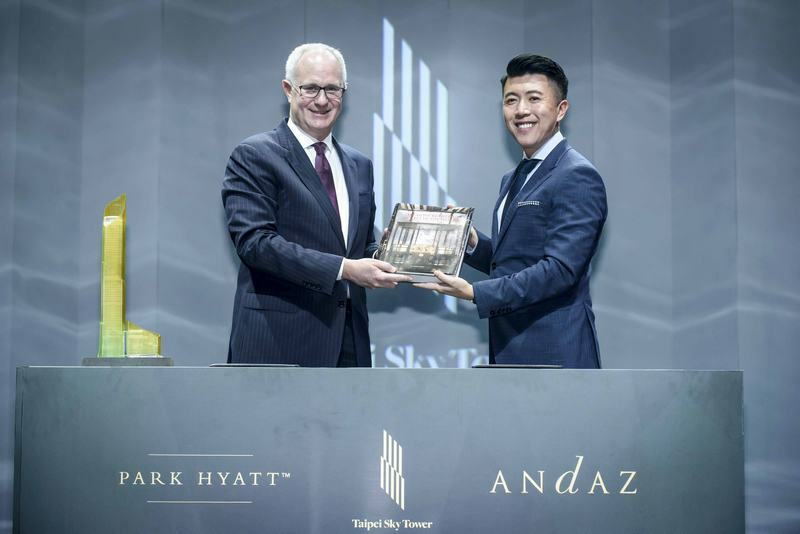 To cater to high-end travelers looking for different types of experiences, TST today announced its collaboration with Hyatt Hotels & Resorts for Asia’s first large scale lifestyle-driven development which will house two Hyatt-branded luxury hotels – Park Hyatt Taipei and Andaz Taipei. This will be the first dual-branded luxury hotel development for Hyatt in Asia. Taipei Sky Tower (TST) is estimated at over 1 billion US dollar in total development cost, one of the largest projects by transaction size in recent years in Asia. This transaction is led by the Taipei-based private equity investment manager, Riant Capital. Situated in Taipei’s most prime location, Xinyi District, the architecture of TST is designed by renowned Italian firm, Antonio Citterio Patricia Viel (ACPV), and will celebrate Taiwan’s unique balance of modernism and tradition. ACPV will also be responsible for designing Park Hyatt Taipei’s interior while the selected designer for Andaz is one of the most dynamic Asian design studios, Shanghai-based, Neri&Hu Design and Research Office. The chosen hotel company and designers demonstrate developer’s clear vision of creating approximately 500 keys, split between two hotels of this new line of hospitality product to differentiate from the pool of hotels that has been built in the global hospitality industry for the past decades. Taking advantage of Hyatt’s pioneering spirit in hotel concepts, and using designers of different cultural backgrounds, generations, and aesthetic styles, TST will not only redefine Taipei as Asia’s next top travel destination, but also promote an enormous business opportunity for Taipei’s luxury tourism industry. In terms of tourist destination, Taiwan has always been a hidden gem in Asia, and has been gradually discovered in recent years for its rich tourism resources. With nearly 10 million residents, Taipei is not only filled with an energetic metropolitan vibe, but its rich cultural atmosphere and local people’s friendliness has great appeal to many international travelers looking for diverse travel experience. According to the Taiwan Tourism Bureau’s data and projection, the number of traveler visit is currently at 10.7 million in 2016 and is expected to increase to 19 million by 2020, of which international tourists will account for 77 percent. This number is still dwarfed by its neighbors, such as Hong Kong’s 57 million, Japan’s 24 million and South Korea’s 17 million in 2016. Thus, the growth potential for Taiwan’s tourism is expected to be one of the highest in Asia. In addition, with its high domestic spending power, the third most concentrated wealth density (*) in Asia, Taiwan has the formula to sustain as one of the top luxury market in the region. Hospitality industry is going through a major revolution globally. Travelers nowadays are placing their lodging accommodation as a big part of their travel experience. Hotels are no longer just a place to sleep when you travel. A mass of conventional hotel products that have been built in the past can no longer meet the needs of travelers today. The online sharing economy and other independent hotels have been filling that gap of creating unique travel experiences, and this sector has been growing exponentially. The consistency of this type of lodging services, however, can never match that of well-run large scale hotels. This missing gap has been identified by Riant Capital as a key investment opportunity in Asia. Aaron Chan, Chairman/CEO of Riant Capital and the driving force behind TST, confirmed the project is scheduled to be completed in 2020. 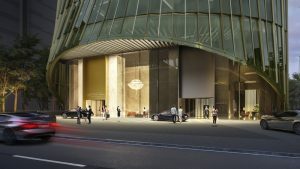 After COMMUNE A7’s trend-setting success, TST is going to be the next enthusiastically anticipated lifestyle landmark. “While social media and online sharing economy are reshaping the global tourism industry, we find this as a unique opportunity and attempt to go a step further. Travelers nowadays are tired of the conventional hotel experience but are still unsure about the consistency of what online short-term lodging offers. We believe this is where the opportunity lies. We want to create a product that is experiential and exciting, and at the same time consistent and operationally well run.” said Chan. 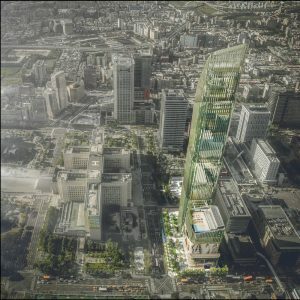 Chan aims to not only build Taiwan’s next-generation landmark skyscraper of innovation, efficiency, and sustainability, but also a diversified lifestyle luxury destination in Taipei that caters to high-end travelers from around the globe. Furthermore, Riant Capital is optimistic about the overall outlook of the luxury travel and hotel industry, and believes that travelers nowadays demand for more than just a typical lodging experience. With only 40 locations worldwide, Park Hyatt is the Group’s ultimate luxury brand known for its attention to detail and unique and exceptional personal service. Andaz, on the other hand, is a newer brand with 18 locations around the globe that is loved for its unconventional hotel style celebrating the local culture and surroundings. The combination of Park Hyatt Taipei and Andaz in one building will bring two unique luxury and lifestyle experiences to TST, and also make Taipei the third city in Asia, after Tokyo and Shanghai, to have both Park Hyatt and Andaz brands under the same city skyline. 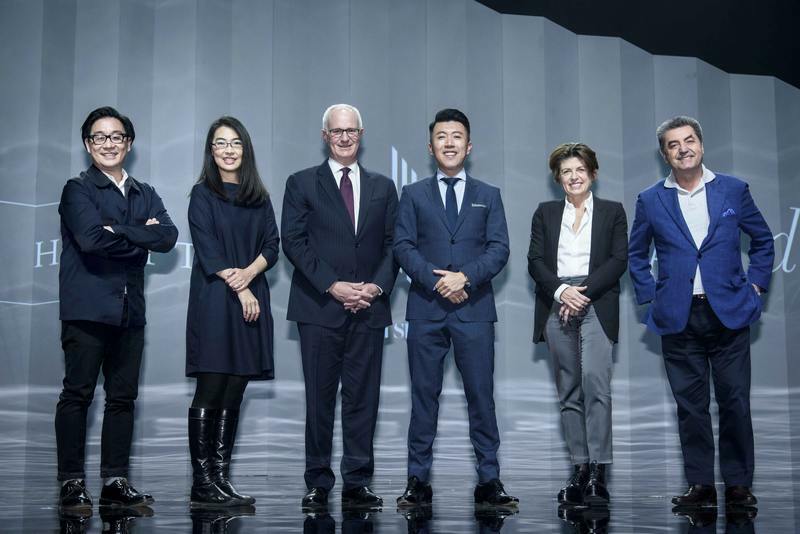 In order to create an unparalleled visual representation for Taipei Sky Tower, Riant Capital invited leading firms from London, New York, Milan, Tokyo, and Hong Kong to share their architecture and interior design visions – a first international architecture competition for private real estate development in Taiwan. The honor of designing the architecture of the skyscraper fell to famed Italian architect firm, Antonio Citterio Patricia Viel (ACPV). Famous for its elegant, classic yet contemporary design, ACPV’s design work has gone beyond the architectural industry. The firm is a frequent design partner for top luxury brands (such as B&B Italia, Ermenegildo Zegna, and Hermes); it is also the heart and soul in creating many iconic luxury hotels around the world. Taking inspiration from the ever-growing Chinese bamboo shoots and the pleats of Greek columns, ACPV aims to create an ultra-modern 280-meter tall skyscraper by blending some of the oldest elements from the East and West in modern harmony. Not just the exterior, the interior design is also a juxtaposing demonstration of Western and Eastern cultural fusion. ACPV will lead the design for Park Hyatt Taipei and this will be in the first Park Hyatt in ACPV’s portfolio. Neri&Hu’s design for Andaz is equally exciting where Lyndon Neri and Rossana Hu will give life to the ingeniously artsy and pioneering Andaz Taipei in a contemporarily and globally interpreted Asian/Taiwanese style. All these serve to bring West and East under the same roof to further underline the exquisiteness of TST. Continuing with the lifestyle theme from the dual hotel concept, the retail podium is equally revolutionary for Taiwan. The retail space will jump out of the typical Taiwanese department store shopping format, and aim to create a 300-meter long of various flagship stores. All stores are carefully selected and all lifestyle driven in order to produce a diverse yet interesting shopping experience. TST is currently in discussion and working with many global brands to create unique stores, focusing on customer in-store experience. As a result, Riant Capital will invite retail tenants early on in the planning and construction phase to maximize design flexibility for their brands. (*) According to Credit Suisse’s 2016 Annual Global Wealth Report, the number of Taiwanese’s Ultra-High-Net-Worth Individual (UHNWI) ranked third in Asia only behind Singapore and Hong Kong, demonstrating Taiwan’s wealth concentration far surpasses that of Japan, South Korean, and other emerging Southeast Asian countries. For more information, please visit andaz.com. Follow @Andaz on Facebook, Twitter and Instagram, and tag photos with #WhenInAndaz.